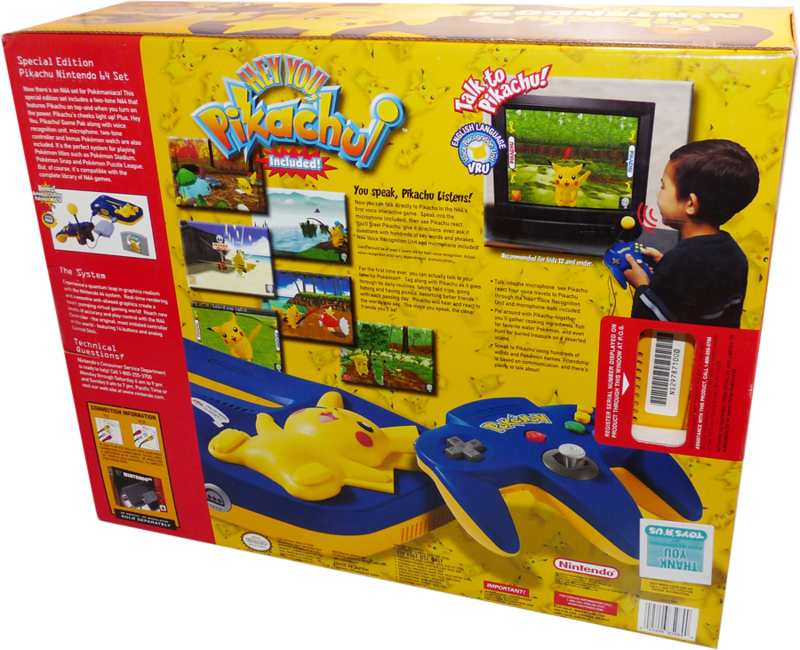 In 1996 With both SEGA and Sony having 32-bit systems on the market with the Saturn and Playstation, it was now Nintendo’s turn to introduce a new system. Enter the Nintendo 64 or N64. Nintendo would skip the “32-bit” era all-together and bill its next generation system as 64-bit! 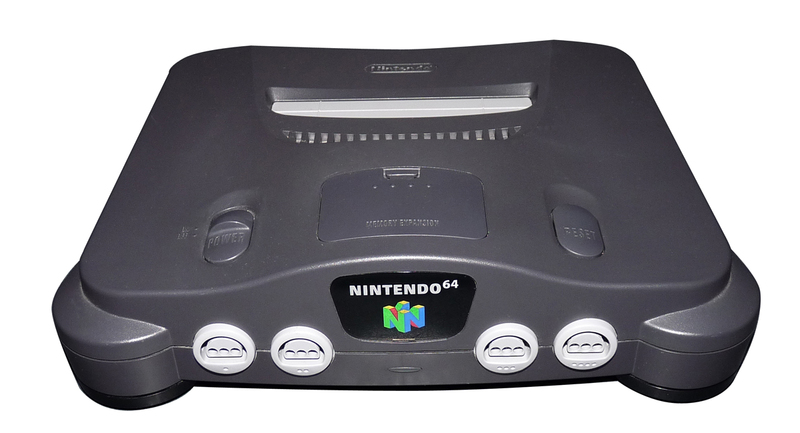 The N64 would be the beginning of Nintendo’s penchant to stray from the norm in console design. 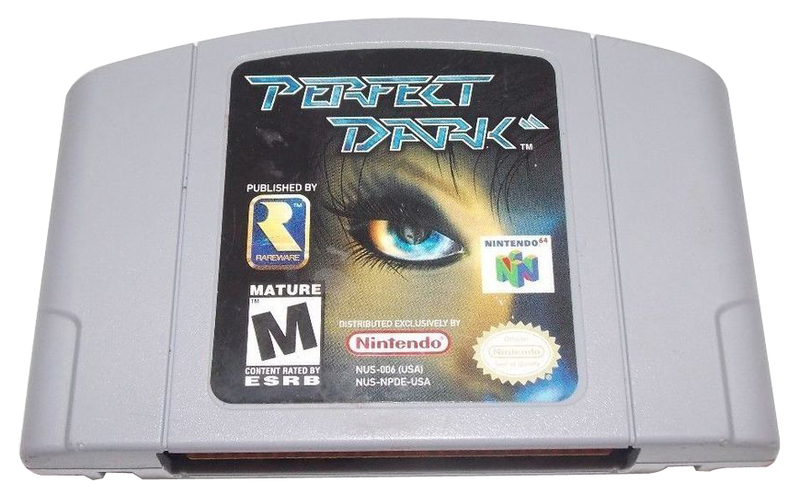 While its competitors system were CD based, Nintendo stuck with the cartridge which proved to be the biggest weak point of the system, if it had one. A strong point of the system was the fact that many of Nintendo’s first party titles from the NES and SNES days made remarkably good transitions to the 3D world. Mario 64, one of only two title available at launch with Pilotwings 64 being the other, was/is a masterpiece and set the the foundation for all future versions of Mario. And by the time Zelda arrived on the console, I was hooked! 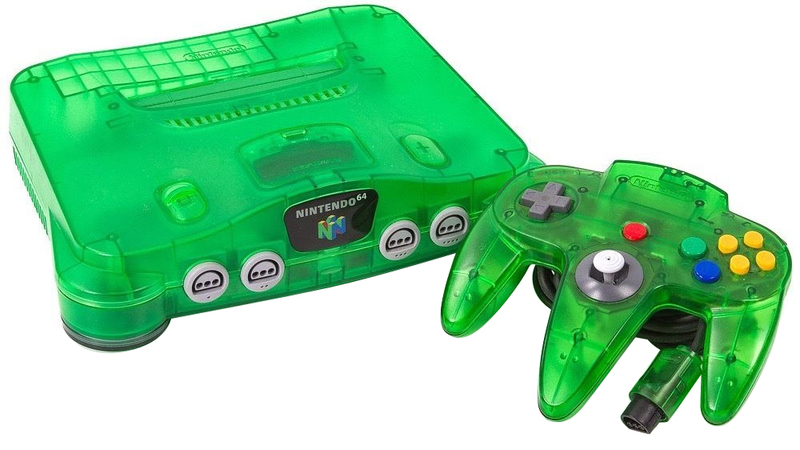 The Nintendo 64 is a slick looking system if you ask me. It’s dark, smoky gray color and curvy front-end are reminiscent of a classic luxury sports car, IMO. And at the time, it performed like one also! The Nintendo 64 has held up well over the years. I have had over 50 units at one time and would say over 90% of them worked, so I find them to be a reliable and resiliant system over the years. Another big factor in their lifespace is due to Nintendo’s decision to stick with the cartridge when everyone else moved to CDs. With a cartridge system you basically have no moving parts, and no moving parts means less things that can break or wear out over time. 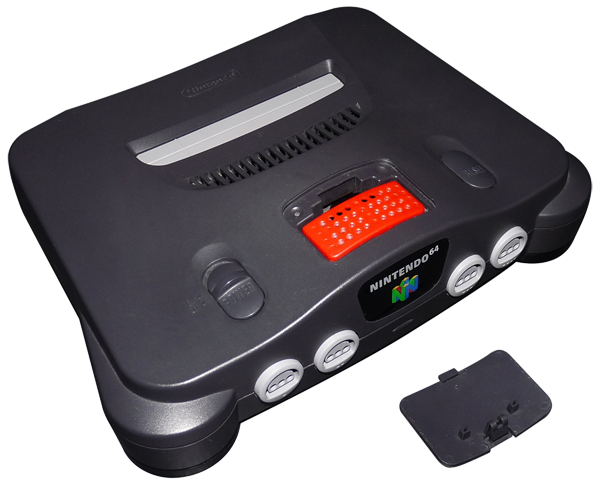 On the front of the unit are 4 controller ports, which many game would take advantage of, and the N64 logo faceplate. On the top of the system we have a power switch to the left and a reset button to the right. Located between these is a lid that can opened to access and increase the RAM of the system with the Expansion Pak, a 4 Meg RAM upgrade to the built in 4 Meg, doubling the total RAM to 8 Meg when installed. The beauty of this was that many games took advantage of the extra ram for better textures, higher resolutions and even extra levels. 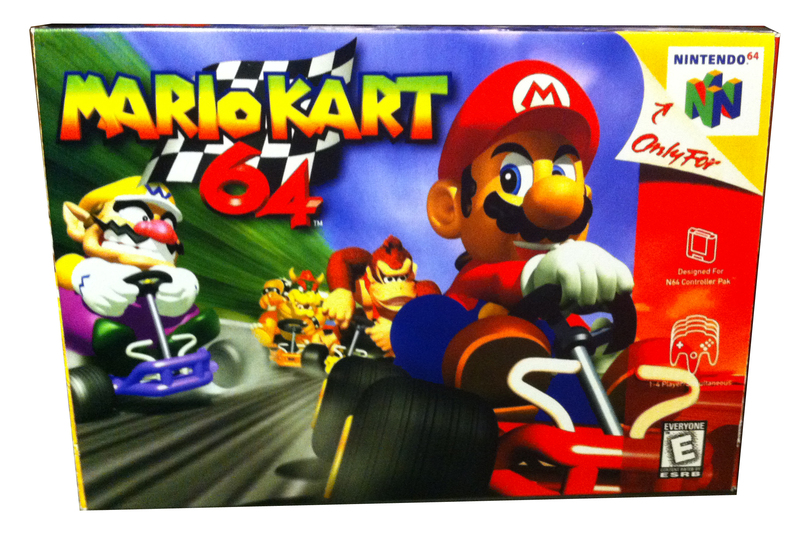 If you have a Nintendo 64 this is a must buy! Behind the expansion bay is the cartridge port. Both the left and right sides of the machine are free of ports. On the rear of the unit are the AV and AC Power ports. For the AV port Nintendo stuck with the same Multi-out cable that they used on the Super Nintendo and would also use on the Nintendo Game Cube. This is great news for collectors as the same cable can be used for multiple systems. In addition you can now get S-video versions for a much sharper picture. The AC power port is a bit different in that there is a huge cavity on the back of the system that the power supply block (nus-002) slides into. The bottom of the system has another expansion port that was never used in the US. It was used in Japan for the 64DD (Disk Drive). During the N64’s 5 year life span there were no major changes made to the system. I have seen some slight internal changes but for the most part the system remained unchanged over the years. 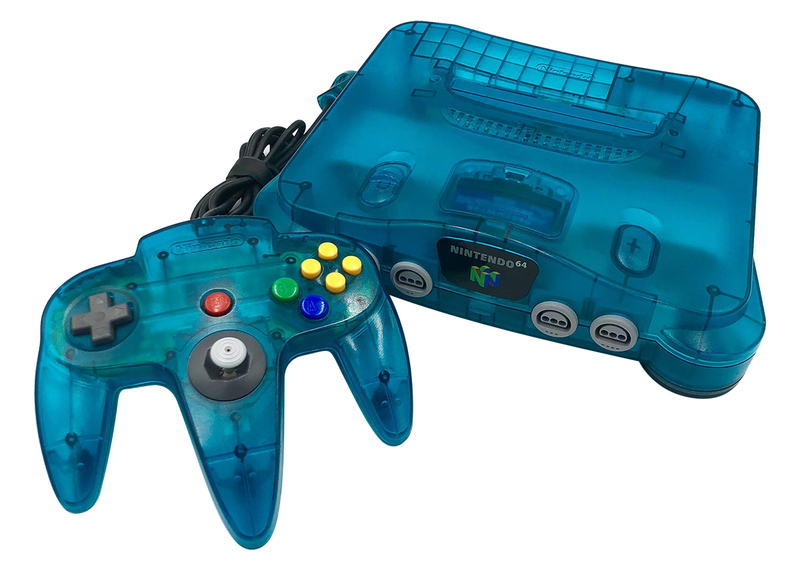 But, as was the norm for Nintendo by this time, there were many color variations available for the N64 and its controllers. 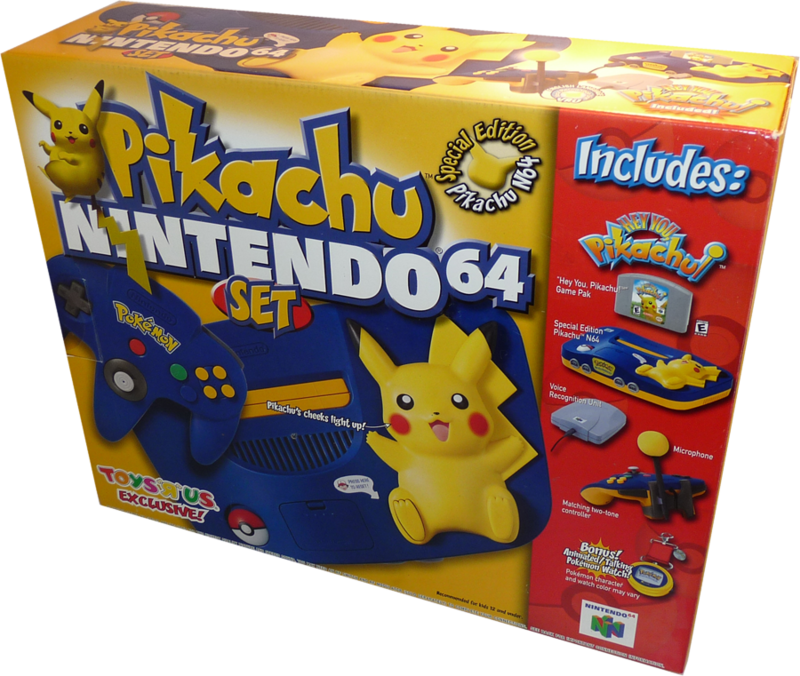 Including some super cool ones like the Pikachu Set. 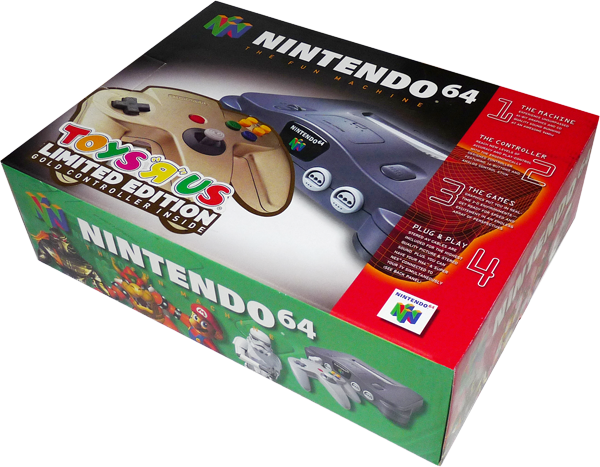 The Nintendo 64 controller was the beginning of Nintendo’s “outside the box” approach when it came to controlling their systems. 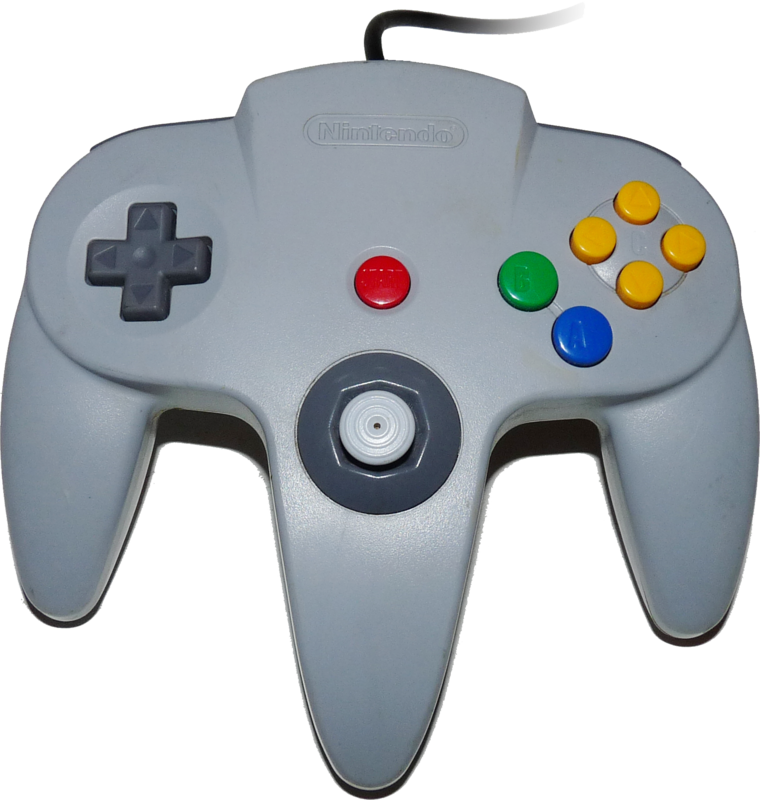 The N64 controller is an odd looking controller at first (and second) glance. But it is very functional for both 2D and 3D game play. On the face of the N64 controller we have your standard D-pad located on the left side. In the center is a red Start button. And on the right we have blue and green A and B buttons, then things get a little strange! The C button is actually four yellow buttons positioned in a North, South, East & West layout. This C button layout esentially can act as a second D-pad on the right side of the controller if the game designers desired so. And finally, located on the middle leg of the controller below the Start button is the new 360° Analog Stick. This was the first time a system had shipped with what has become the standard directional stick, allowing much better controls for 3D environments. The stick itself sits up tall out of the controller and has a large degree of swing, and is spring loaded so it will self center when released (until it doesn’t, more on that below). On the top of the controller are also Left and Right shoulder buttons and the connection wire that runs to the system. On the bottom of the controller underneath the middle leg with the 360° analog stick is a Z-trigger button. 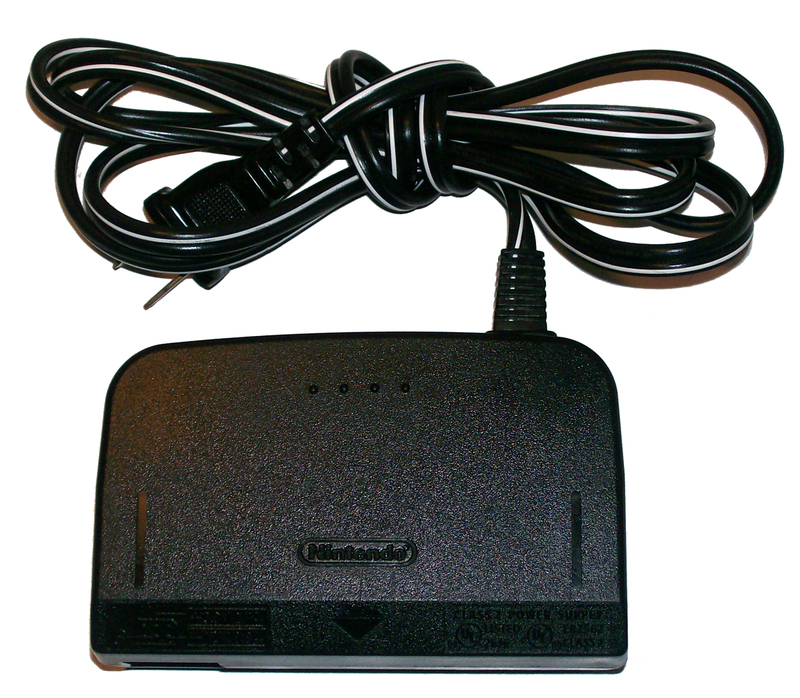 And toward the top, facing down is a connection port for attaching various modules to the controller like the Rumble Pak and Memory Cards. Whew! Now let’s talk about how to hold this beast! 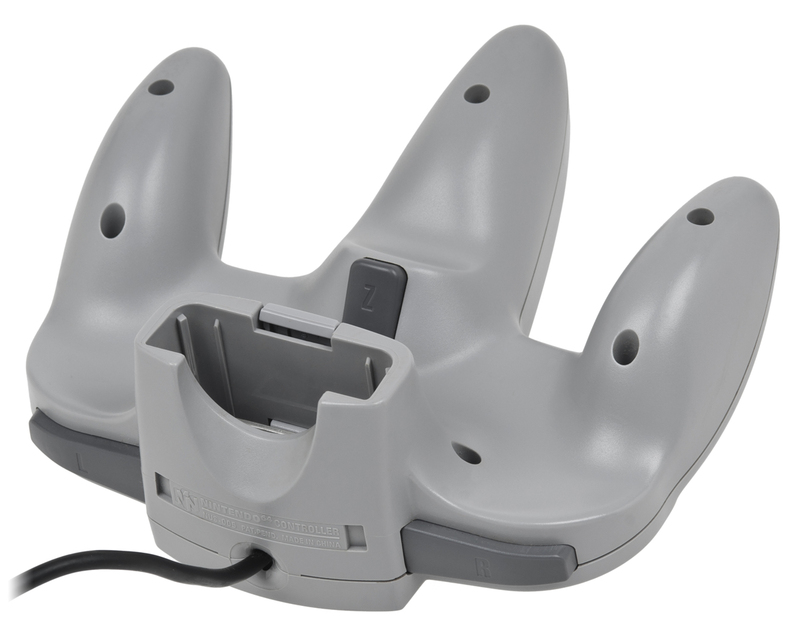 As you can see from the image, there are three hand positions available when using the standard Nintendo 64 controller. Often times the position used is based on the game. With only one analog stick, in a first person style game, you can often use either positions 1 or 2 for looking around and then use the D-pad or C-buttons (as a D-pad) to control movement. In any position you end up with a trigger button, either using the top L & R buttons, or one of them with the Z button (located under the middle leg of the controller acting as the “other” L or R button. Not always ideal but it’s what we got, and we liked it! In regards to durability, the analog controller is the Achilles Heel of the N64 controller. Over time and hard use, they become loose and often lean to one side and won’t stand up. Or in many cases they simply break off as they are raised up with a thin shaft of plastic. If you’re looking for one make sure you ask about or try out the analog stick. 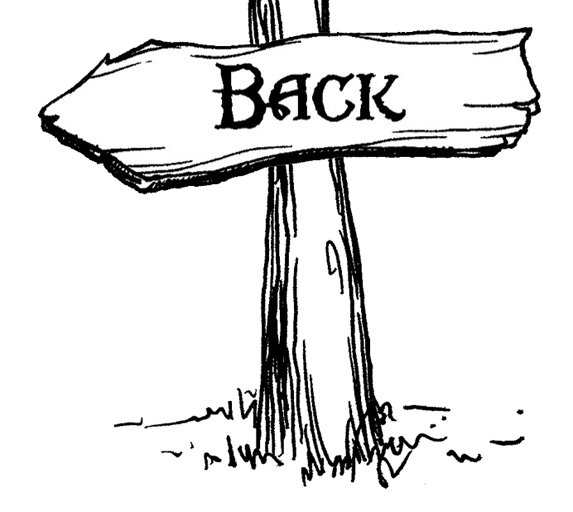 But rest assured, these sticks are also repairable with replacements available online. Not the easiest repair to do, but not too hard either. And par for the course, the controller came available in over a dozen colors. Special colored systems would come with a matching controller or they could be bought separately. 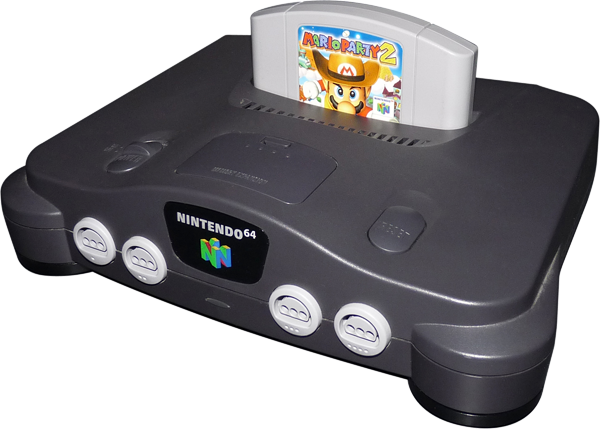 The N64 was Nintendo’s first system with true 3D capabilities, and they showed it off at launch with Mario 64. Compared to it’s competition, the SEGA Saturn and SONY Playstation, I would say the N64 could handle larger environments better with less pop-up or draw-in—take Zelda Ocarina of Time for example. But due to cartridge restrictions, many other areas were not as capable. The game cartridges could contain 4 MB of storage space all the way up to 64 MB, which is minuscule compared to the CD based competition which could hold over 600 MB on a less expensive CD. With the limited space, textures are often muddy or blurry and stretched to fit the polygon. Also, you didn’t have the storage for full fledged CD quality music, so music scores that appeared on other systems would be reduced in length or removed from the N64 version. Another popular element on CD based game were movie cut-scenes, animated or live video. 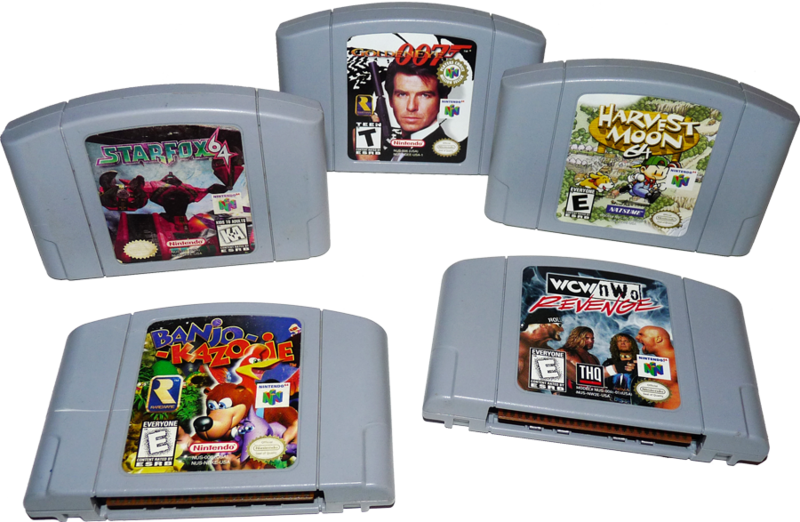 These also required too much space and are all but absent from N64 games. Still, with the 4 MB expansion installed and larger 32 – 64 MB carts used, textures and game resolutions could be increased to make some stunning looking games for the time. When comparing the number of games available the Nintendo 64 fell far behind its predecessors the NES and SNES, both with over 700 titles released in the US while the N64 would boast a little over 380 games released in the US. The cartridge storage and its cost were some of the main culprits that lead to this shortage. But again, don’t fret, there are many stellar quality games to be had for the Nintendo 64… like, the first true 3D Mario Kart, Star Fox 64, Star Wars Rouge Squadron, Donkey Kong 64 (or pretty much any game made by RARE), and of course Super Smash Bros. 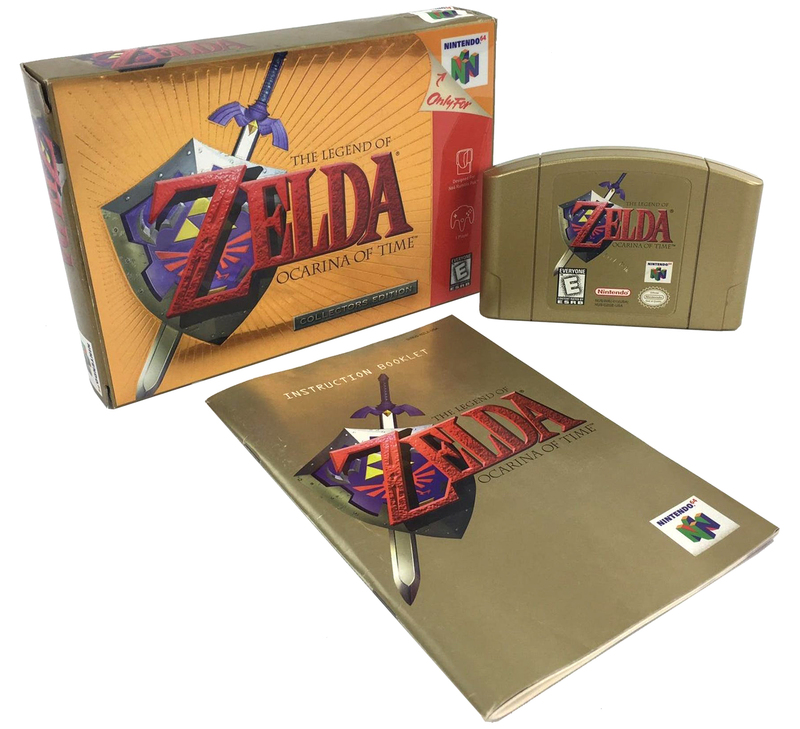 The games came in a wide cardboard box like all previous Nintendo systems, and much like them finding the game you are looking for complete in box can be harder and more expensive than just the cart alone. As for the cartridges they are thick and fairly sturdy, although I have had many that have pieces broken off of the cart, but this often has no effect on its ability to play. One issue that has always bothered me (and others) is that the top of the cart is rounded. This makes it more challenging to store and the fact that there is no label on the top of the game means when you have them in a drawer of stage case, you can’t tell which game is which unless you pull it out and look at the front, but it’s really nothing, I’m already over it. Check out the latest Gametrog reviews and more!